Home >> Generated from JAN's SOAR Information System on 4/21/2019 12:10:27 AM. Unlike grab bars, this sturdy design allows users to both push down and pull, helping to promote greater independence. 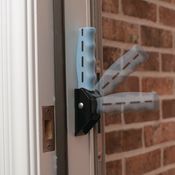 Durable construction for interior and exterior applications features a glow in the dark, non-slip grip and is small enough to fit in spaces where a large grab bar won’t work, like doorways. Easy to install and folds easily out of the way.